Our history goes back to the 1980’s, when vaulting was introduced to Great Britain by Ann Sagar. In 1983 Ann founded the British Vaulting Association, and our vaulting talent began to flourish. In 1988, Great Britain sent it’s first team to the World Championships in Austria. The following year, Valley Farm hosted the first friendly International Vaulting event in August 1989. This event took place annually for five years. Things changed in 1990 when we became part of the BHS, and were known as BHS Vaulting. 1990 also saw us compete at the first World Equestrian Games in Stockholm, and BHS Vaulting selected a team of vaulters from all over Great Britain to represent us. This team competed on Kim and the team were lunged by Jenny Leggate. In 1991, we held our first British Championships, and this event has been held annually for the past 25 years. It was 1996 that saw us become the organisation that everyone knows today, British Equestrian Vaulting (BEV). BEV were incorporated as a Limited company, and we have never looked back. It was in 1996 that Julie Newell organised Great Britain’s first official International event, a CVA, which was held at Stoneleigh. This was also the year that Scottish Equestrian Vaulting were formed, and a team of Scottish vaulters started competing internationally. The following year, 1997, Julie Newell organised another international event, this time the bar was raised and Julie held a CVI at Stoneleigh. 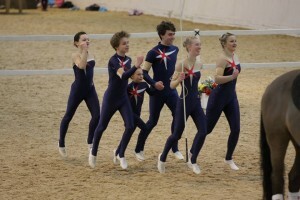 In 2000, the English Vaulting Squad (EVS) was formed to advance team vaulting in England up to International level. The Millenium also saw the third international competition, this time it was held at Moreton Morrell. In 2004, the first English Championships were held. By 2010, we were proud to announce that John Eccles and Sarah Gemmell had been promoted to FEI judges, our first FEI judges in Great Britain. 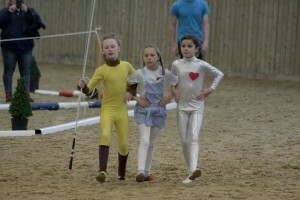 2010 also saw vaulting appear on Blue Peter, when the programme featured EVS. And in 2010 we were also delighted to fly our horses to the World Equestrian Games in Kentucky. Our first WEG. Not only was it our first WEG, our very own Joanne Eccles won Gold in the individual female competition, vaulting on W.H.Bently, lunged by John Eccles. British Equestrian Vaulting: The BEF affiliated discipline of Equestrian vaulting in Great Britain. © 2016 British Equestrian Vaulting. All Rights Reserved.